The international conference for doctoral students: "Sacral Space. This international conference is intended for all Czech and international doctoral students on full-time or part-time study programmes in the fields of art history, theology, literature, music, and other cultural and historical disciplines. The aim of the conference is to enable students to present the results of their research so far, to introduce new and current insights based on their work on their dissertation, to compare their methodological approaches, and thus to support their research activities. The theme of the conference was deliberately chosen so as to include the broadest possible circle of doctoral students from humanities study programmes and to provide sufficient scope for choosing a theme and elaborating it. Papers submitted for the conference can deal with related themes in the fields of theology, history, the visual arts, cultural history, literature, music, and so on. They will be assessed primarily on the correct choice of methodical approach in dealing with the individual theme and the specialist quality of their conception. The emphasis will be placed on publishing completely new findings rather than on compilation work. Like last year, we will welcome a prominent guest to our Faculty for the conference. A special lecture will be given during the conference. 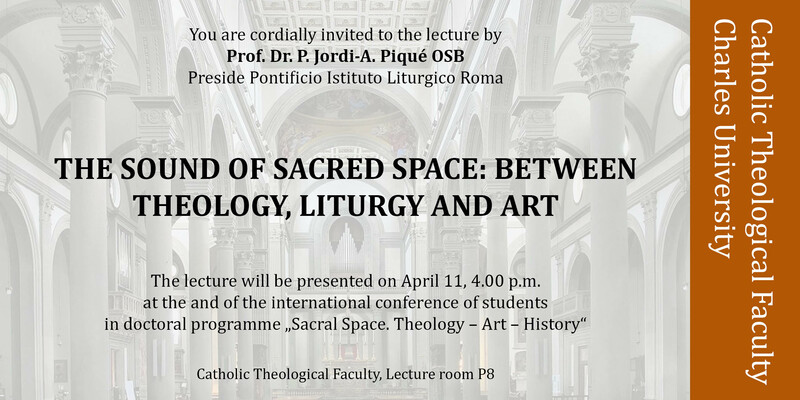 You are cordially invited to attend the whole of the conference, and in particular the special lecture, whose theme and speaker will be made known in advance. The various papers presented at the conference will be divided into several sections according to their subject. Twenty minutes will be allowed for each paper, and sufficient time will be devoted to discussion on each theme. The number of active participants at the conference will be limited by the size of the different sections. The organisers are planning to publish the proceedings of the conference in peer-reviewed form after it has finished. The organising committee reserves the right to select papers for publication in a peer-reviewed journal on the basis of expert opinions drawn up by independent experts on the theme in question. Languages for publication in the conference proceedings are Czech, English, Italian, and German. by 16th January 2019 at the latest. They will then be notified by the organisers whether they have been accepted to take part in the conference or not by 31th January 2019. Conference fee have to be paid no later than 20th February 2019. No refunds will be given for cancellation. The organisers are unable to cover the costs of transport or accommodation for active conference participants. However, they will provide help in finding accommodation, especially to international participants. Doc. PhDr. Martin Zlatohlávek, Ph.D., prof. PhDr. Petr Kubín, Ph.D., Th.D.